How will the proposed new Highways England Abnormal Loads Template impact the Abnormal Load Industry? Recently Highways England released a new Abnormal Loads notification template which they announced would soon become mandatory for abnormal load notifications made to all Highways England Areas administered directly in house by Highways England. Currently these Areas are East Midlands, North East, North Lancashire & Cumbria and the South West. More are in the pipeline. If a haulier chooses not to use the new template form, their alternative notification methods are to use ESDAL2 or their alternative ‘xml’ file compilation (their API). This new ‘pdf’ template requires manual completion by hauliers. As shown, this is difficult, slow and inaccurate in respect of the route details. It will result in significant, sometimes very significant, increased notification costs for the majority of hauliers and inaccurate and imprecise route information for structure owners and police authorities using ESDAL to view abnormal load notifications. the structural assets it was designed to safeguard, and the options available to Structure Owning Authorities to best manage the notifications they receive. Read the White Paper by John Waterfall MA FICE MCIHT, Chairman, Cascade Software Limited. Cascade Software, the Abnormal Loads Software and Service Specialists, is delighted to announce that it has been selected by Dorset County Council and Cheshire East Highways to provide a dedicated abnormal loads management and checking service to hauliers submitting abnormal load notifications to both structure owning authorities. AbHaulier LT update - the number of downloads of AbHaulier LT has exceeded all expectations. The overwhelming response from hauliers clearly demonstrates the overwhelming need for a free and easy to use abnormal load notification tool. 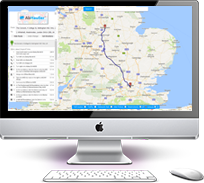 Cascade Software, the Abnormal Load Software and Service Specialists is delighted to announce the release of AbHaulier LT, a completely free software tool that enables hauliers to submit abnormal load notifications to police and structure owning authorities. AbHaulier LT is available immediately via here. Cascade freezes the price of its popular AbHaulier software for 12 months and adds major new functionality to the product for customers free of charge. Sally Waterfall, Managing Director of Cascade Software, comments “We are delighted that AbHaulier remains an extremely popular software solution used by a large number of customers to submit abnormal load notifications to Police and Structure Owning Authorities." How would the proposed new Highways England Abnormal Loads Template impact the Abnormal Load Industry? Abnormal load notification - is there an easier way? 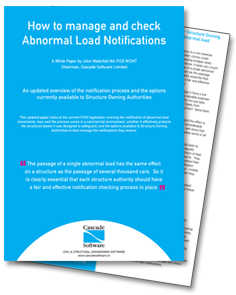 Outsourcing Your Abnormal Load Notifications - A Load off Your Mind?